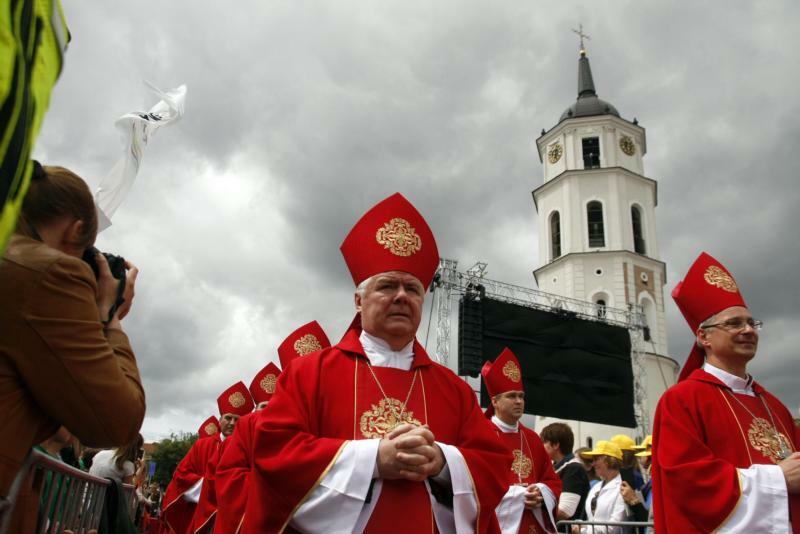 VILNIUS, Lithuania (CNS) — A Catholic archbishop who was murdered by Soviet police to prevent him attending the Second Vatican Council became the first communist-era martyr beatified in Lithuania. “Long, hard years of prison, labor camp and house arrest may have gradually impoverished this strong, courageous witness of the Gospel, but persecution and torture never broke his will,” Cardinal Angelo Amato, prefect of the Vatican’s Congregation for Saints’ Causes, said at the June 25 beatification mass for Archbishop Teofil Matulionis. Beatification is a step toward sainthood. “We could ask why a man who spent so many years of life in prisons and labor camps and wore prison clothes until retirement never felt hostility for his enemy. The answer lies in God’s grace, which ennobles the soul, enabling it to see God’s goodness and providence in others, where some see only hatred and evil,” he said at the Mass in Cathedral Square. The cardinal said Blessed Matulionis, who was murdered in his apartment with a lethal injection in 1962 after 16 years of Soviet incarceration, had remained a “humble, generous, gentle and loyal man,” despite “relentless dictatorship.” He said one Soviet official had predicted the archbishop, would be proclaimed a saint and attract pilgrims to his graveside. “The memory of past suffering should not cloud our joy, but it should remind everyone to respect their neighbor,” Cardinal Amato said. Born at Kudoriskis, Blessed Matulionis was ordained in St. Petersburg, Russia, in 1900 and ran the city’s St. Catherine Church after parish work in neighboring Latvia. In 1929 he was secretly ordained a bishop, but was sent without trial to a labor camp, before being allowed back to Lithuania in a 1933 prisoner exchange. Appointed bishop of Kaisiadorys, he was again arrested in 1946 for refusing to collaborate with Lithuania’s Soviet occupiers. When he was released from prison camps in 1956, he secretly resumed his episcopal functions. Pope John XXIII elevated him to archbishop in 1962, but the Soviets refused to let him attend Vatican II. He was killed by an injection believed administered by a KGB police nurse following a brutal beating in his apartment. In a message to the Vilnius Mass, Pope Francis praised Blessed Matulionis as a “courageous defender of faith and human dignity,” whose example remained topical in a society that created its own “temporary truths” and often humiliated religious believers.